How Does Forskohlii Help with Weight Loss? Subject: How Does Forskohlii Help with Weight Loss? Forskohlii is a root extract of an Ayurvedic herb historically used in the treatment of heart disease, spasmodic pain, and urinary tract infection. An organic compound called forskolin was isolated from this herb. A group of researchers looked into the potential health benefits of forskolin and found out that regular intake results in an increase in lean mass, the reason why it is now commercially touted to aid weight loss. It has also grown in popularity as a bodybuilding supplement. Plectranthus barbatus is an ornamental plant native to India. Also classified as Coleus forskohlii, this plant species belongs to the mint family. It is grown for its purple flowers and medicinal root, where the chemical compound forskolin is extracted from. It has become increasingly popular in North America, especially among bodybuilders. It is aggressively marketed largely owing to the absence of side effects. In all human studies on forskohlii, no known adverse effect has ever been observed. It has long been postulated that intake of forskohlii root extracts promotes the utilization of adipose tissue, or body fat. This has been observed in several studies, though the exact mechanism of action remains under scrutiny. Bodybuilders greatly benefits from supplementation of this herbal extract as it not only removes unwanted subcutaneous fats but also stimulates the formation of lean muscles. Adipose tissue is the primary energy stores in the form of lipids, or fat droplets. This tissue can be found everywhere in the human body, though the term body fat is often used to refer to subcutaneous fat. Forskohlii induces muscle cells to convert adipose tissue into usable energy for use by cells in addition to glucose. This enables the body to lose fat and power intense exercise at the same time. Forskohlii has been tied to energy production for years. A popular belief is that it converts fats to energy. Another theory that has caught the attention of researchers is its role in increasing the metabolic rate. Faster metabolism translates as faster utilization of biological resources, including fats and glucose recently absorbed from the diet. Building muscle mass fast has been linked to a faster metabolic rate as skeletal muscles benefits from uptake of nutrients. In fact, muscle recovery necessitates the presence of nutrients. Proponents believe that forskohlii increases productions of thyroid hormones and modulates their effects, the reason why it affects metabolism and energy production. 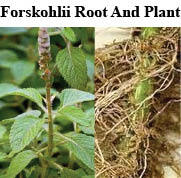 Forskohlii is thought to influence the distribution of nutrients throughout the human body. Its putative effect on thyroid hormones encompasses all aspects of metabolism, including the utilization of nutrients of every tissue and organ of the body. While this remains under investigation, anecdotal evidence is very encouraging. Plus, decades-long supplementation has not produced any adverse effects. Fight Weight Gain with Natural Forskohlii!